While the rest of the country is digging itself out of snow, us coastal Californians can turn our attention to the spring growing season. I love gardening. Growing up, I’d help my mother in our gardens, and loved planting starter plants in the ground. I’d work alongside my mom, pouring water from the watering can into the hole that she had made in the dirt. After she placed the plant in the ground, I’d push the dirt back in and pat the dirt around the base as if to tuck the plant into bed. When I moved out on my own, I began to garden in containers on my patio since I didn’t have a yard. I grew basil, cilantro, pole beans, tomatoes and sunflowers. My grandfather was an avid gardener as well. He tended a garden in a neighbor’s yard, growing tons of vegetables. Now whenever I garden, I think of him. I was thinking of him this weekend when I planted my starter seeds. The benefit of living in a fairly mild climate is that I get to start my seeds now. We’re also fortunate to rent a house with a small greenhouse in back. My lemon and nectarine trees have been living there since we moved up here last fall. Both trees have done well and are even beginning to bud. Johnny’s Selected Seeds is my go-to seed company. They have a wide selection of seeds, they’re an employee-owned company and they’re based out of Maine so I feel like I’m buying from my peeps. This year, I’m growing: bok choi, spring onions, 3 kinds of cucumbers including lemon cucumbers which I’m super stoked to try, black prince tomatoes, purple haze carrots, d’avignon radishes, pole beans, basil and zucchini. 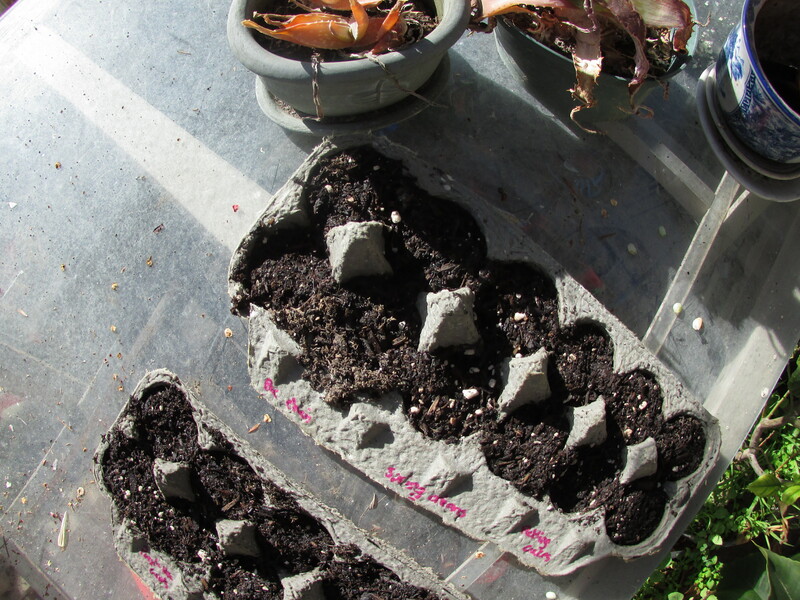 Once I have another egg carton available, I plan to plant okra and maybe cantaloupe. It’s no secret that produce in the store is pricey, and with California in the midst of a serious drought (with word that the Central Valley—where most of the country’s produce is grown—won’t be receiving much water from the state this year), it’ll be important to grow your own produce to save money and have yummy nutritious food on hand. 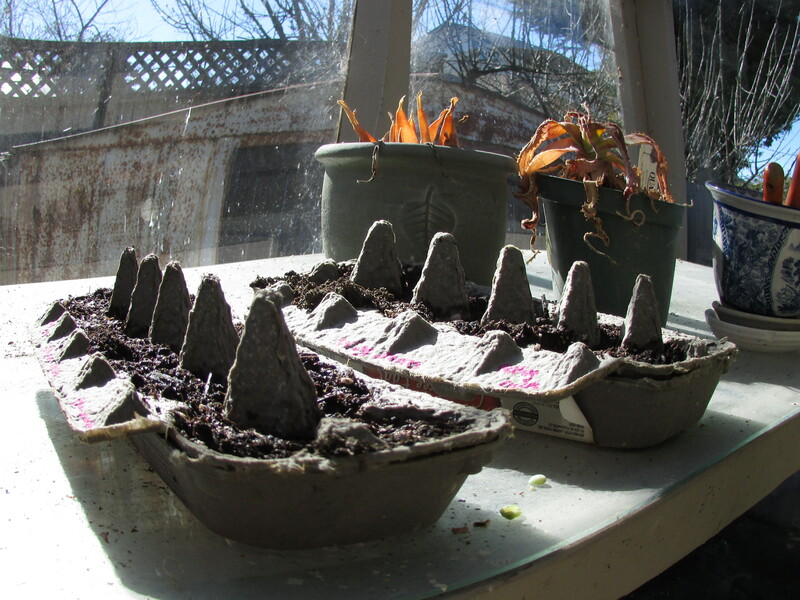 But for now I sit and wait to see those little green sprouts break through the surface of the soil. My grandfather was an avid organic gardener in the 50s. I learned so much from him. I feel like I keep his memory alive when I use some of the tips and tricks he taught me. 🙂 Happy gardening, blogger friend! I use Johnny’s, too. Reminds me, I have some ordering to do. Wish I had the California sunshine to make my things grow, though.